More than 0.5 million Ukrainian citizens have arrived in EU member countries since the day the Ukraine-EU visa-free travel deal took effect, and more than 21,000 of them used their biometric passports as the only travel document, the Ukrainian State Border Service said. "Over 100,000 Ukrainians were traveling with biometric passports, including 21,200 compatriots who used the visa-free travel benefits and crossed the border with their biometric passports only," the service said. A total of 6,745 Ukrainians, 32% of the entire number, travelled visa-free to Europe by plane. The others travelled by rail or crossed the border via motor checkpoints, mostly on the border with Poland (8,725 Ukrainian citizens) and Hungary (2,840 Ukrainian citizens). 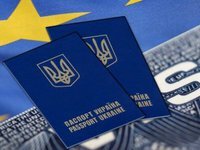 The number of Ukrainian citizens traveling to the European Union visa-free increased a lot on weekend, border guards said. Twenty-six Ukrainian citizens have been denied admission since the visa-free travel took effect.